Nicole Watts presents on ‘Protests and Activism in Halabja and Sulaimani, 2006–Present’ during the first panel of the workshop. Despite huge Iraqi, regional and international opposition, Masoud Barzani, the President of the KRI, went ahead with an independence referendum on 25 September 2017. The results showed an overwhelming endorsement of a split from Baghdad. However, the referendum did not deliver the enhanced bargaining power that the President was hoping for in negotiating independence. Instead, the KRI lost the gains they had made during the fight against ISIS and President Barzani announced his resignation. Iraq responded with a legal decree declaring the referendum illegal, imposing a blockade on international flights to and from the KRI, taking over Kirkuk, and emphasising the importance of Iraqi sovereignty and unity. The referendum and its aftermath further deepened internal political divisions in the region, exacerbated tensions within the PUK, further intensified the economic crisis in the KRI, and possibly diminished any chances of realising Kurdish independence in the near future. The post-referendum crisis once again showed the severity of the outstanding issues between Baghdad and Erbil; namely, territorial disputes, distribution of the federal budget, and the ownership and sale of oil. 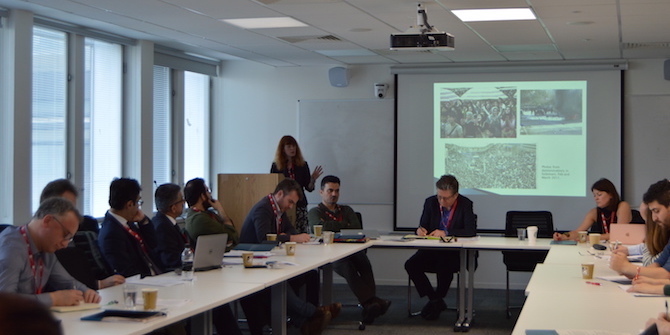 The LSE Middle East Centre convened a workshop on 16 March 2018, bringing together Kurdish political, economic and social analysts and decision-makers with other experts on Iraq and the KRI. It examined the major dynamics that will shape Iraqi-Kurdish politics going forward. The workshop was split into four sessions. The first examined the history of protest in the KRI, and the circumstances under which it arises. The second focused on state–society relations in the Region, looking at service delivery, democratic mechanisms and the government’s repressive apparatus. The third looked at the Region’s political economy, with a focus on the oil sector and the public payroll. The final panel discussed the KRI’s international relations and the regional fallout in the wake of the referendum. This blog series features a selection of the presentations from the workshop. This is the introduction to the proceedings of a workshop on Iraq and its Regions: The Future of the Kurdistan Region of Iraq after the Referendum, held at the LSE on 16 March 2018. See below for the full list of papers.